PTC®'s Spot-Check® Series of thermometers feature outstanding response and sensitivity. Their extremely low thermal mass and weight (1/2 ounce), along with a unique design, assure intimate thermal contact and a very rapid readout. Each thermometer is guaranteed to an accuracy of ± 2% of full-scale range. The instrument's bimetallic coil directly contacts the surface to be measured. In response to temperature, the sensor expands or contracts to cause the dial itself to rotate. These instruments can be used to quickly check surface temperatures or can be permanently mounted. They can be used for such applications as hot plates, griddles, furnaces, annealing and curing ovens, weld preheats, motors, generators, engines, bearings, etc. Available in either Fahrenheit or Celsius models, they come in several temperature ranges, covering a total span of 0° to 1000°F (0°C to 525°C). Two models are available with stainless steel dials that are designed for use in vacuum chambers. Models 575FMSS and 575CMSS feature dials with no paint or ceramics that could outgas. The dials are made with uncoated metals and etched to provide the temperature markings. All Spot Check® thermometers come with a spring lifter knob to enable the user to safely remove the instrument from a heated surface. The knob is threaded and attaches to the center post of the thermometer. The basic thermometer is designed for horizontal or slightly curved surfaces. 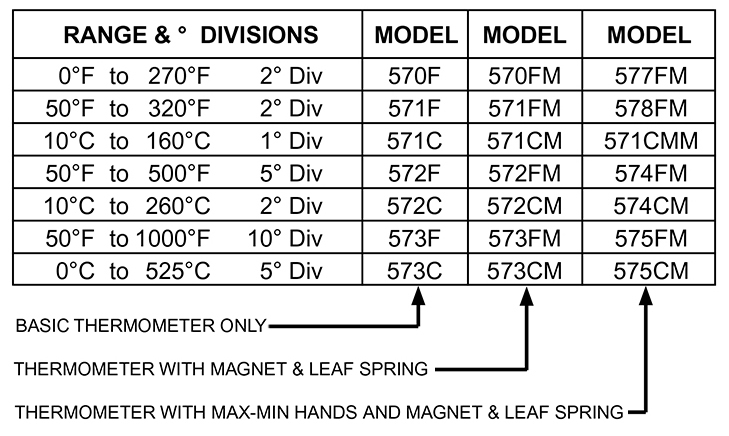 The magnetic leaf spring is to hold the thermometer against non-horizontal, ferrous surfaces. Comes with Magnetic Leaf Spring, min-max hands and stainless steel dial for use in vacuum chamber. Copyright PTC® Instruments On-Line Store. All Rights Reserved. Shopping Cart Software powered by 3DCart.